Making a taggie stuffed animal for baby is a fast, simple, and inexpensive project that baby will be sure to love! 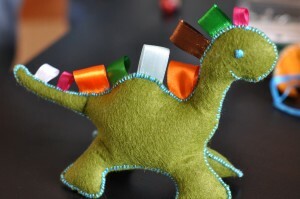 I made a taggie dinosaur for my 7 month old son, and he loves chewing on the ribbons, head, and tail. I’m sure your baby will love it too. The core idea of this project is the same as the post I wrote on How to Make a Stuffed Animal Dog for Baby with a few minor adjustments. In this post, I will tell you how I made a stuffed taggie dinosaur, but the pattern could easily be adjusted to make any type of animal you’d like. Buying a diaper bag can easily cost over $50, and sometimes even over $100! However, if you’re a little bit crafty, you can make your own diaper bag for much less. And on top of that, you will have a very cute and customized diaper bag that you know no one else will have, plus the bragging rights to say you made it yourself. I stumbled across the pattern for a very cute and simple diaper bag, called “The Detour”, on a website called Make-Baby-Stuff.com. The creator of the website gives great step-by-step instructions, including pictures, to make the process of making your own diaper bag as simple as possible. Although I have not personally made a diaper bag using this pattern as of yet, I definitely plan on doing so in the near future and sharing my experience and pictures. I simply wanted to share this great find right away! Here is a fun and easy project to make a very cute stuffed animal dog for your baby which can either be used for play, decorating the nursery, or even decorating at a baby shower. The idea and pattern came from allsorts. This project took approximately 2 hours for me to complete including the time it took to cut out the material. I’m sure it would have gone faster but it was my first project of this type. It is very easy to do. My 8 and 10 year old nephews made them right along with me with little help. I also changed the pattern a little bit from the original. I cut the ears off and rounded the nose off for my nephews’ dogs and also changed the bottom piece from the original so I didn’t have to sew as many pieces. 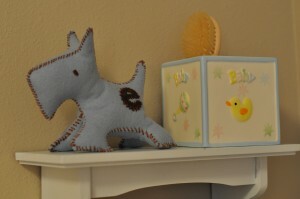 I then had them sew “floppy ears” on their dogs versus the spiked ears in the pattern. Either way, it’s an easy and fun project to do. 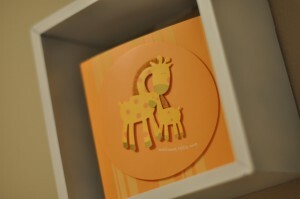 Want a quick and easy way to decorate your baby’s nursery? Try paper lanterns! 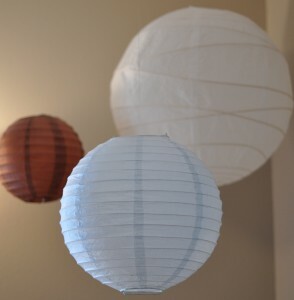 Paper lanterns are a simple and inexpensive way to add a modern and unique feel to the baby nursery. They come in a large variety of shapes, sizes, colors, and patterns so you’re sure to find the perfect fit for your nursery’s theme and decor. You can even buy small lights to hang inside to give your nursery a beautiful, calming glow. You’ve gotten everything ready that you need for the baby nursery from furniture to the wall hangings. The paint is on the walls and you’re ready to move everything in. But there is one problem…you’re not sure how! One of the most exciting parts for most parents when planning for the arrival of their baby is designing a nursery. One of the biggest decisions that needs to be made in planning the nursery is choosing a color scheme. The colors you will use are a key component that will set the mood in the nursery, so you will need to choose wisely. With thousands of colors and combinations to choose from, how can you make the best decision to create the perfect nursery of your dreams? First and foremost, you need to start with an idea of what you want before just rushing to the store and buying the first paint colors that look good. Many times, unless you’re one of the few lucky people out there, this will only bring disappointment and frustration. Remember, it is best to take your time when planning the perfect nursery, so make sure you give yourself enough time to plan before baby arrives. One of the best places to find ideas for your nursery is the Internet. You will find thousands of ideas from both professional and personal sources. See what other people have done, and decide what you like and what you don’t. One of my favorite places to get color schemes is HGTV’s Rate My Space website. You could also try going to a book store and browsing room decorating books. The way that I chose a color scheme for the nursery was by selecting the bedding I was going to use first. I had no idea what colors or theme I wanted to go with for the nursery. I decided that first I would choose a bedding set and then base my colors from that, which worked out great. If you are having trouble knowing what colors you want to use based off of a website or book, maybe you will be inspired by a blanket or maybe even a picture. Shop around until you know what you want to do. Once you have an idea of a scheme, it’s time to test it before you decide to put it on your walls. Many companies that sell paint have a place on their website to test color combinations in a room of your choice, such as the Sherwin-Williams paint visualizer. You can oftentimes select a premade room or even upload a picture of the nursery itself to try different colors in. This tool will give you the name of the paints you have selected so you can know exactly what you want when you go to make a purchase. Also, this tool can be helpful as it will automatically generate ideas for coordinating colors to accent the nursery with if you’re not sure what colors would be complimentary. Keep in mind that your nursery will probably have at least three colors involved; the wall color, the furniture color, and an accenting color. For example, the main colors for my son’s room are white (the furniture), soft beige (the walls), and chocolate brown and sky blue as accents. Accents can be anything from artwork, bedding, shelves, a rocking chair, or even the dresser painted a custom color. Unless your theme is monochromatic, you will want to have at least three colors overall in the nursery. Taking a trip to your local paint store and selecting the color swatches is the next step, whether you have used an online tool to select them, or whether you are just going by what catches your eye. If you are basing your color selections from bedding or a picture, bring the item with you so you can easily match colors or find coordinating colors without having to guess. Even if you’ve used an online tool to visualize the paint colors in a room, it is probably a good idea to bring several swatches home with you before making a purchase. Many times paint colors will look very different on a computer screen or on a swatch in the store. Most importantly, save yourself some frustration by bringing the swatches home first and looking at them in the light of the room it may be used in. Look at it during different times of the day. Some paint companies sell miniature containers of paint colors to paint a small portion of your wall to test the color before investing in a large amount. Do what you think will help you make the best decision. Once you have selected your colors, it’s time to decide how to use them. You may decide to paint the walls one solid color or paint one wall an accent color, such as the wall behind the crib. Making a pattern or design such as stripes or circles is another option. Try drawing it on a piece of paper first before you go for it. 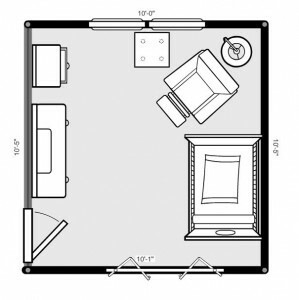 You probably don’t want your nursery to be too busy and drawing it first will help you visualize a pattern. Remember that the main wall color will have the most effect on the mood of the room, so if you are wanting a calm room, use lighter colors. If you want a bold or rich room, use the brighter or darker colors. Once you have decided on the wall colors, the accent colors will fall into place. Accent colors are just the icing on the cake, adding visual interest to highlight different areas of the room. 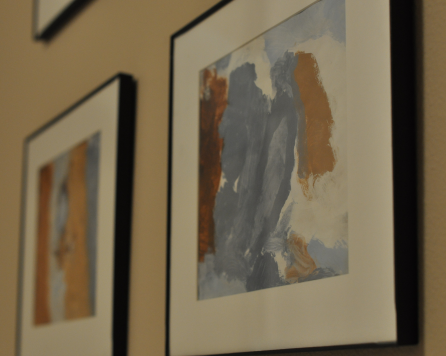 You can use accent colors in the bedding, furniture, or the artwork you choose for the nursery. If you are especially creative, you may want to paint-your-own nursery artwork. Just remember that the accent color should not overwhelm the space, but be used tastefully and in key places. Trust your gut when deciding on how much to accent and when in doubt, get a second opinion of a trusted friend or family member who will be honest. Most importantly, don’t be overwhelmed by the process. Planning the color scheme of your baby’s nursery should be fun and not stressful. If you find you are having a hard time, step away from it for a while until you can come back to it with full energy and a fresh start. Go with your vision and make it happen! And once you’re done with the colors, you may need help choosing your nursery layout. 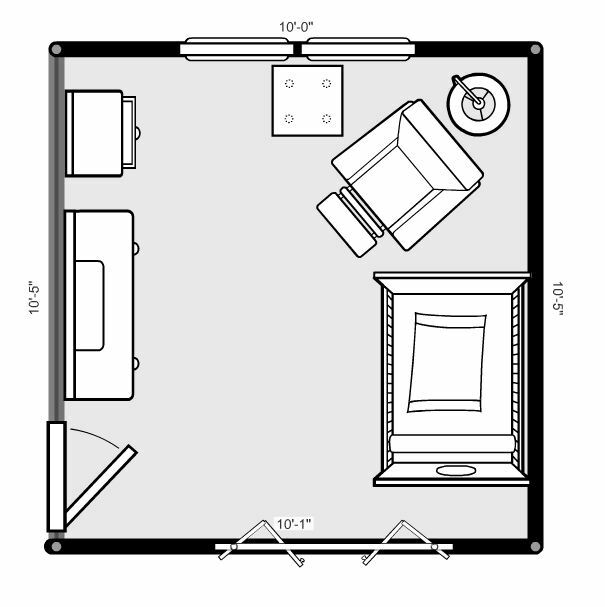 Read about choosing a layout for the nursery right now. How did you make your decision for a nursery color scheme? Want to spice up your nursery walls and not break the bank? Here is a simple and inexpensive idea to get you started. I personally did this for my son’s nursery. These come in all colors. I love classic black and white! For my project I bought four large plastic picture frames that came with a white matting. They were only $3 a piece. If you are able to spend more money, you can get a rich-looking, long-lasting wood frame. If you don’t already have brushes and paints on hand, you can easily find some at a craft store or maybe you know someone who can lend them to you. Choose colors that match your room’s theme. I bought two shades of brown and two shades of blue and white for accenting since these were the colors I was using in the nursery. It’s time to paint! I simply used the paper that came inside the frame and painted the back. This way I had a sure fit when I was done. Choose your design and go for it. Don’t stress over trying to make your painting look perfect. Imperfections give character. In my case, I didn’t do the painting at all. I asked my nieces and nephews to do it for me! They each got their own paper and I told them they could paint whatever they wanted (using the colors I provided), just as long as they filled the paper completely. So how did it turn out? I got four unique, abstract pieces of art to group above my sons crib. They loved the fact that they were painting something for baby, and I loved the fact that the paintings had sentimental value. So, what do you think? Share your projects and ideas with me!